In 2018, we are proud to once again offer CADABRA (AUS) - HSH to the Australian public. 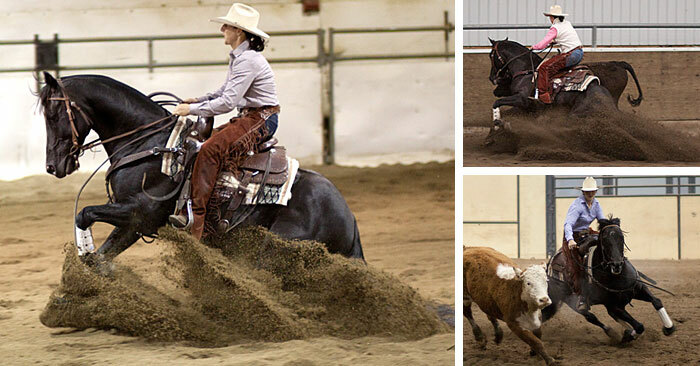 This famous stallion has shaken the mainstream idea of the Australian Stock Horse, and what they are capable of, becoming the foundation sire of the Canadian ASH and making history as the first of his breed to compete and win in international cow horse competition. 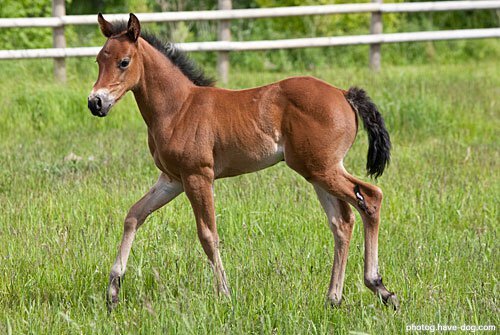 *Cadabra has been colour tested and his results state that he is homozygous for black pigment, which means he will not sire red (chestnut) foals. L-R: Cadabra's grandsire Abdul with the Australian top honor, the Warwick Cup; Foundation Sire Abbey (top); Foundation Sire Star Black Minstral (bottom); Cadabra's sire Palmers Fort Abdul (center); Cadabra's dam Star Caddie in action (top); Foundation Sire Elliots Creek Cadet (bottom). Cadabra's sire was the lovely stallion, Palmers Fort Abdul. Bred by the respected Palmer Family Partnership, Fort Abdul himself was sired by the Warwick Gold Cup winner Abdul-IS, and born from the same dam as Better View Gunfire, Palmers Sissy-FM. The Palmer Family Partnership presented Palmers Fort Abdul at the 1978 Dalby ASH Sale where the 3yo colt caught the eye of master horseman, Vic Gough. Vic explains, "He struck me as being a very naturally balanced horse for his age, and he was an outstanding type." 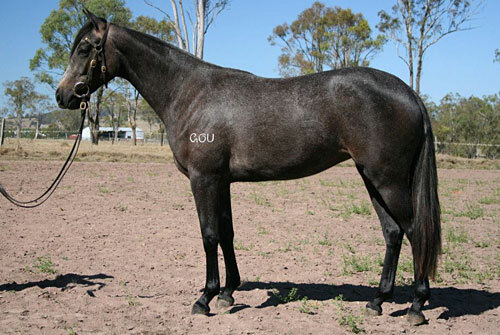 And so, for the grand sum of $3,000 (which in 2010 would be valued at $13,150), the young sire moved to the Gough family's 'Dinkum Stud' in Queensland. On passing away in 2005, Palmers Fort Abdul left behind a legacy of 153 registered Australian Stock Horse progeny. Vic continues, "It is a testament to the quality of Fort Abdul that he sired a number of sought-after stallions, and still has his descendants winning in the performance arena today. He was never advertised and promoted, and never had the quality of mares that many stallions today have, so it's a joy to see that he is survived by a sire like Cadabra." 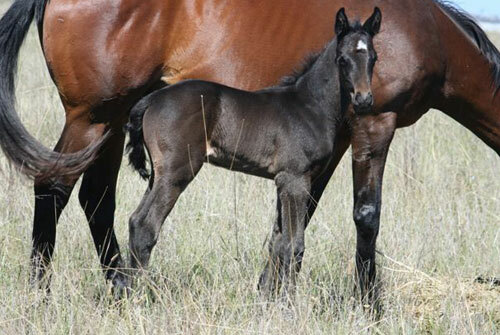 An outstanding aspect of Cadabra's pedigree is that he is a son of one of Australia's top campdraft mares, Star Caddie. Owned by the Roberts family, she has been campaigned by many great riders such as Ken Boulton, Vic Gough and Terry Hall. 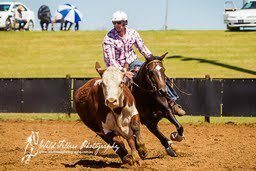 Here at Icewood we have some outstanding footage of Star Caddie scoring a 91 under Terry Hall in the second round of the Chinchilla Grandfather Clock Open Campdraft in 2005. The same year Maryanne was able to ride the lovely mare and made the final of the Chinchilla Ladies Campdraft with an 87. Maryanne continues, "Being able to ride Star Caddie was a great opportunity, and there is something to be said for being able to ride a sire's parents, and to see where some of their traits come from. Cadabra definately inherited some exceptional qualities from both sides of his family tree, and now these qualities are coming through clearly in his progeny." Perhaps Star Caddie's most outstanding achievement however, was placing second from a field of hundreds in the 1998 Warwick Gold Cup under Ken Boulton. 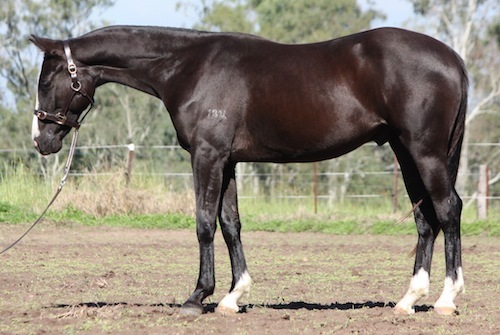 She is an exceptional example of the heritage Australian Stock Horse, with bloodlines no longer able to be replicated. She is sired by the great Star Black Minstral-FS (dec) from Mills Stud Caddie, an own daughter of Elliots Creek Cadet-FS (dec). 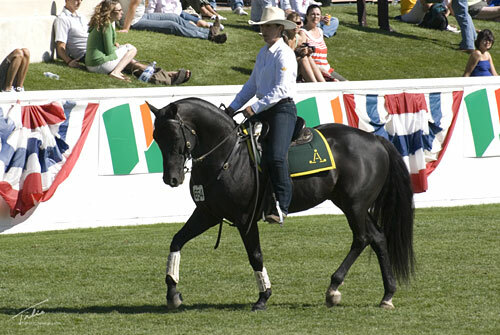 In March of 2009, Cadabra was exported from Australia to Canada, to become the foundation sire for the first Australian Stock Horse stud in the country. During his time abroad, he became one of the most recognised ambassadors for the Australian Stock Horse breed in the world, due not only to his impressive performance record in the competition arena; but also his presentations at major equine venues in North America. 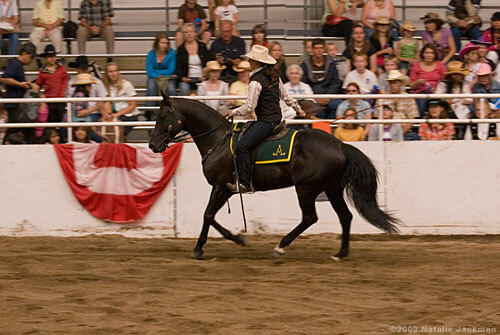 SPRUCE MEADOWS :: This 360 acre venue holds its annual 'Masters' Showjumping spectacular, plus a Breeds for the World Exhibit and huge trade fair, in September near Calgary. In 2009, the atmosphere was intense as the warm up was shared with everything from miniature donkeys in carts to Tennessee Walking Horses 'racking' - the Australian Stock Horse contingent did add its own flavour though, turning heads with whipcracking and Polocrosse balls! It was nothing to ride past Olympic Showjumping champions, such as Ian Miller, as they returned from the huge stadium. Free entry to the event saw around 200,000 horse lovers walk through the gates and the majority left having witnessed their first-ever Australian Stock Horse display! 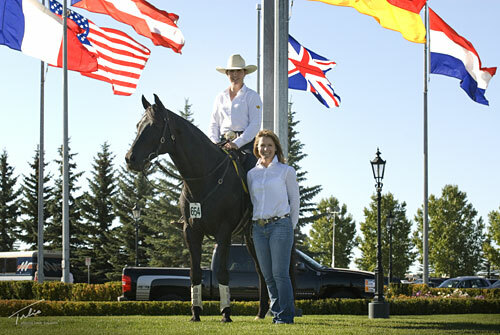 L-R: Cadabra, Maryanne and Jacquie McArthur pose under the Spruce Meadows flags; Cadabra performs on THE MEADOWS ON THE GREEN; showing off the breed with some trademark fast work. CALGARY STAMPEDE :: Internationally famous, this ten-day event, which is a mecca for anyone with a 'cowboy' streak, averages an attendance around 1.2 million. The world's most famous cowboys, cutters and cowhorse trainers, mingled with the renowned chuckwagon drivers descend on downtown Calgary for the 'Greatest Outdoor Show on Earth'. 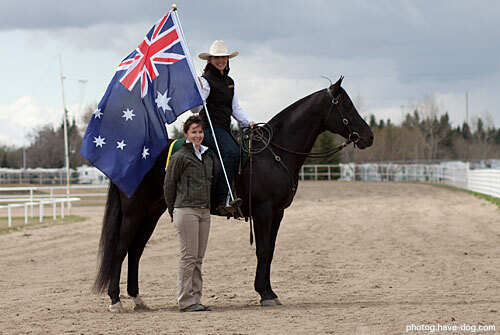 The first Australian Stock Horse presented at this enormous public event, was CADABRA (AUS), and Maryanne and Jacquie ran the first Australian Stock Horse booth at this event. Glen Gough was on hand to participate as an announcer and rider for the demonstrations, and was a valuable member of the information booth! 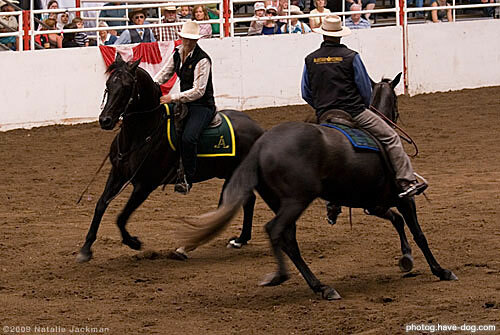 L-R: Maryanne riding Cadabra and Glen Gough on Condamine Rivoli Idol perform their routine at the 2009 Calgary Stampede; Maryanne and Cadabra pose in front of the famous Calgary Stampede rodeo arena; entertaining the crowd with a traditional whip-cracking display. 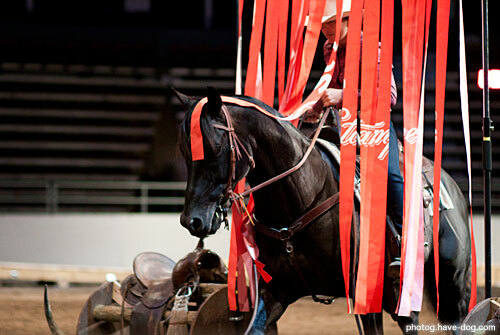 THE MANE EVENT :: Averaging an attendance of 45,000, this weekend event is a major platform for clinicians and trainers, plus it also holds a famous horse-related trade fair. 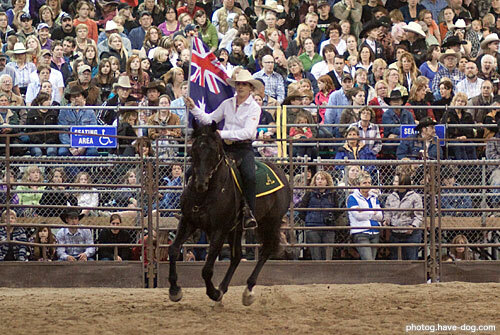 In 2010, Maryanne and Jacquie ran the first Australian Stock Horse information booth at this venue, and Cadabra continued his trend, becoming the first Australian Stock Horse presented at this venue. 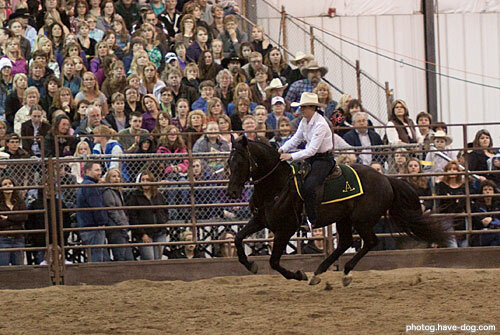 The Saturday Night Showcase attracts a huge, 'standing-room only' crowd is the highlight of the weekend; Cadabra and Maryanne's demonstration was mentioned in the Mane Event blog as one of the Top Ten highlights of the weekend! L-R: Cadabra, Maryanne and Jacquie McArthur 'flying the flag' for Australia; Cadabra performs for a standing-room only crowd; Cadabra performed to music which included Waltzing Matilda, the Australian Anthem and an instrumental of Midnight Oil's 'Bed's Are Burning'! 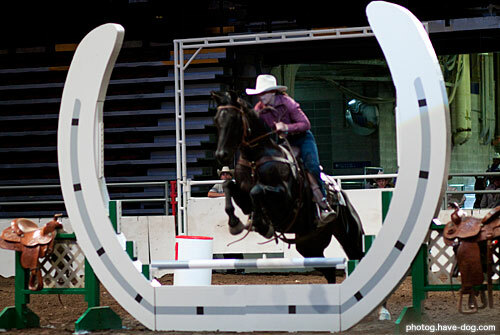 EXCA COWBOY UP CHALLENGE :: In July of 2010, Maryanne and Cadabra competed in the Calgary Stampede's first-ever 'Extreme Cowboy Race'! Created by renowned clinician Craig Cameron, entry into the event was strictly by approval only and required video footage along with the other entry conditions. The event was run over three rounds, and the course changed each time. Horse and rider were presented with completely unknown elements which they had one opportunity to 'walk' 10 minutes before the event began. The horses didn't see anything until they entered to compete. Bright moving stagelights on the ground, double level and moving bridges, strange jumps, mirrors, floating bridges (yes in water! ), curtains, dragging calf sleds - plus some very unusual props! 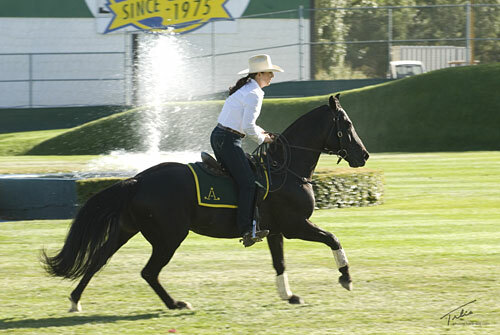 The pair had a great time and again, Cadabra was the first of his breed to ever present in an event like this! 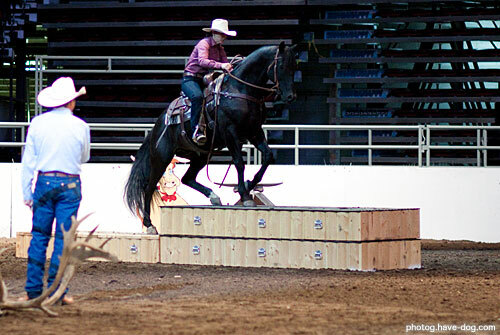 L-R: Cadabra shows his jumping style over one of the Cowboy Challenge obstacles; through the 'cowboy curtain'; up and over the double decker bridge. Moss is a well known Polo X mare in the outback zone where she has won Best horse of the Carnival as well as best horse and rider per grade awards. 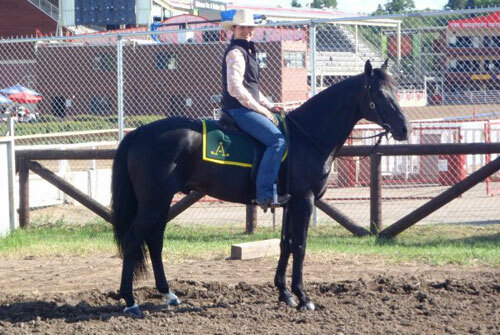 The Perkins family chose CADABRA because of his impeccable breeding, looks and temperament. Already a winner of Led, Hack and Working ASH classes, Glow was broken in by his lady owner. So impressed with him, she purchased another Cadabra baby to repeat the process again! Bred by the M Bar Ranch in Irvine, Alberta, this filly impressed so much, the ranch sent two mares back to CADABRA the following season!